One married couple is fighting ICE after a husband was detained during an interview. Now, months later, that man's husband is still fighting. 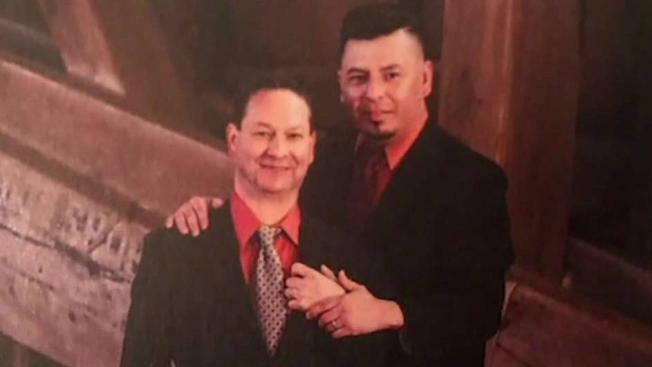 Jose Ivan Nunez Martinez and his American husband, Paul Frame, thought they were walking into a routine green card interview in January. Instead, the 37-year-old Nunez Martinez, who was born in Michoacan, Mexico, was arrested by Immigration and Customs Enforcement. Nearly four months later, the pair is still fighting for Nunez Martinez's release. He has been detained at York County Prison without a bond hearing since Jan. 31. On Tuesday, the American Civil Liberties Union of Pennsylvania and Philadelphia law firm DLA Piper LLP filed a legal complaint on behalf of the couple, calling for an end to Nunez Martinez’s detention. The couple first met in August 2014. Nunez Martinez had already been living in the United States for more than a decade working as a mechanic and janitor. Two years after meeting, Frame and Nunez Martinez got married. The freedom to do so was one of the driving factors behind his decision to emigrate from Mexico. Nunez Martinez’s friend, also a gay man, was killed in 2001. That same year, Nunez Martinez fled to the border and only traveled back once in 2010 when his mother became ill. When he attempted to return, Nunez Martinez received an expedited removal order and was sent back to Mexico. He re-entered a few months later and ICE reinstated his prior order of expedited removal. Nunez Martinez was apprehended during a mandatory interview with U.S. Citizenship and Immigration Services, the agency responsible for processing immigration and naturalization applications. Frame had already submitted a petition to make his husband a legal citizen, a fairly routine procedure that thousands of couples undergo after a foreign national marries an American citizen. But before Nunez Martinez’s case was heard, ICE arrested him. “When an individual has been ordered removed and is encountered by ICE, ICE reactivates the prior order,” Audrey Allen, one of the lawyers working on the case, told NBC News in February. Allen added that the only relief available to him would be a Withholding of Removal claim, which is similar to an asylum claim. The couple believes they have a valid claim to keep Nunez Martinez in the U.S. Not only are they already married, but Nunez Martinez fears for his life if he were to return to Mexico. Meanwhile, 49 foreign nationals were arrested in Philadelphia area in the past week, according to ICE. They include people from Jamaica, Mexico, Colombia and the Dominican Republic.